WONDERFUL WINTER WORKSHOP: IT REALLY WAS WONDERFUL! SUNDAY afternoon, Tuesday evening; cannot believe it came and went so quickly. Sunday was such a full and exciting day. Artist/teachers leading participants with extensive dance training and some beginners, or dancers with extensive training in other dance forms trying something new. 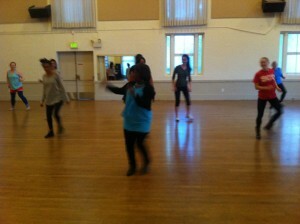 There were several Bharatnatyam artists, for example, taking Contemporary, Salsa, and Line Dancing for the first time. This way of getting into the spirit of dancing is just what WWW.1.0 is all about. Amity Johnson’s Pilates mat class was a fantastic full body tune up. One very experienced dancer who also is a Pilates regular was heard to say, “It was great and now my stomach muscles will hurt all week.” We all need to have those moments of direct communication with our stomach muscles! Just returning from Tuesday evening’s classes. The participants not only danced full out and had a great time, they learned a lot and polished up what they had begun on Sunday or at the International Dance Festival@Silicon Valley, Aug. 2014. Here are some pictures; more will come soon. To the left and on top: Etta Walton leads line dances. 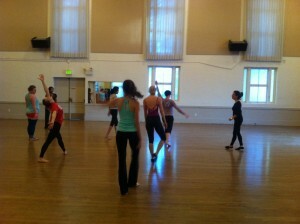 Below: Leslie Friedman teaches Contemporary class. Tuesday night’s classes had that feeling of the last day of camp. Everyone was reluctant to say the dance was ending. Only for now. This entry was posted in INTERNATIONAL DANCE FESTIVAL-SILICON VALLEY and tagged Amity Johnson, Bharatanatyam, Contemporary Dance Classes, Etta Walton, International Dance Festival-Silicon Valley, Leanne Rinelli, Leslie Arbogast, Leslie Friedman, Line Dances, Mountain View Masonic Center, Pilates, Wonderful Winter Workshop, WWW.1.0 on January 21, 2015 by Leslie.